The one-of-a-kind bear is made from an Australian opossum fur coat. 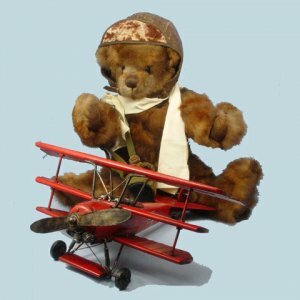 He is 20" tall and comes with a WWII aviator cap, goggles, and a replica of his own metal red tri-winged plane. He has leather paw pads, glass eyes, stitched nose, and silk scarf. Heir Bears have been created from recycled and pre-owned fur coats. These furs were found at estate sales, thrift shops, yard sales, or hiding in the back of someone's closet. Now they have been carefully transformed into lovable teddy bears, ready and eager to start a new life and become a cherished heirloom. Each teddy bear has a unique personality all its own. Most of them are one-of-a-kind designs. All have been created from original patterns by the artist, and totally handcrafted from start to finish by the artist.